Yes, I would like to receive updates and information from Smithsonian Magazine. Yes, I would also like to receive information on programs, offers, and specials from the Smithsonian and its partners. Card Verification Number: What is this? Membership Automatic Renewal Feature: I understand that my membership and 11 issue subscription will be renewed automatically until I cancel my membership. I will receive an automatic renewal notice before my subscription expires stating the low renewal rate then in effect. If I do nothing, my credit card will be charged. If my credit card cannot be charged, I will receive an invoice instead. I can cancel at any time at 1-800-766-2149 and receive a full refund for any unmailed issues. Your first issue will arrive in six to eight weeks. All profits from the magazine support the institution. 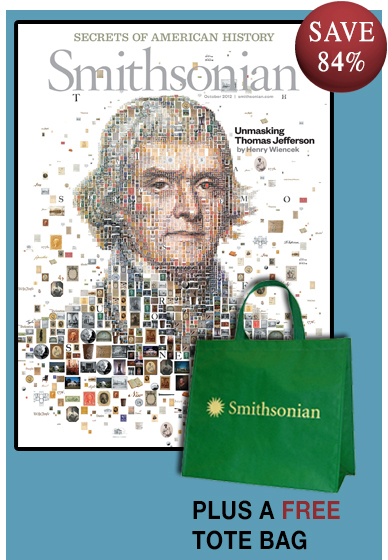 Ninety-nine percent of membership dues are allocated for Smithsonian magazine. Member discounts may vary. Smithsonian eco-tote bag supplies are limited. Smithsonian is usually published eleven times a year, but occasionally publishes combined issues, which count as two issues.